Soldiers near an S-300 surface-to-air missile complex during joint Russian-Belarussian exercises on September 24, 2009. Moscow, Russia (CNN) -- Russia has deployed a surface-to-air missile system in the breakaway Georgian territory of Abkhazia, the Russian air force commander said Wednesday. 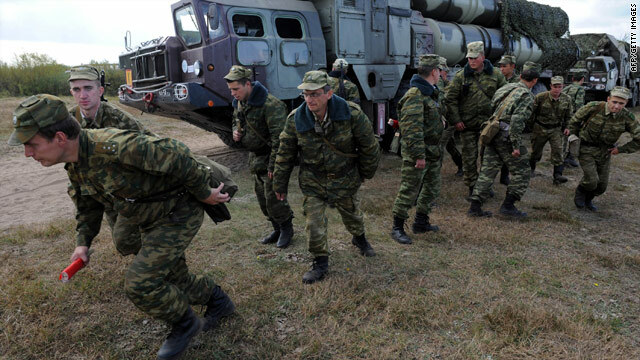 The S-300 system will help "ensure the security" of Abkhazia and South Ossetia, another breakaway territory in Georgia, Russian Air Force Commander Col. Alexander Zelin told journalists Wednesday, the Russian Air Force told CNN. It is also designed to protect the Russian military base in Abkhazia, a Russian-backed territory, he said. The systems are intended to "prevent violations of the state borders in airspace, as well as to destroy any aerial vehicles, regardless of their mission, that cross into the airspace over the protected territories without permission," Zelin said, according to the Air Force. Russia and Georgia fought a five-day conflict in 2008 that began when Georgia launched a campaign against South Ossetia. The following day, Russian tanks, troops, and armored vehicles poured into both South Ossetia and Abkhazia and soon advanced into Georgian cities outside the rebel regions. A total of about 850 people were killed on all sides and untold numbers of others were wounded or left missing, a European Union fact-finding mission concluded last year. Russia and Georgia each blamed the other for starting the conflict, though the EU mission said it was rooted in a "profusion" of causes. Moscow has since recognized South Ossetia and Abkhazia as independent regions.